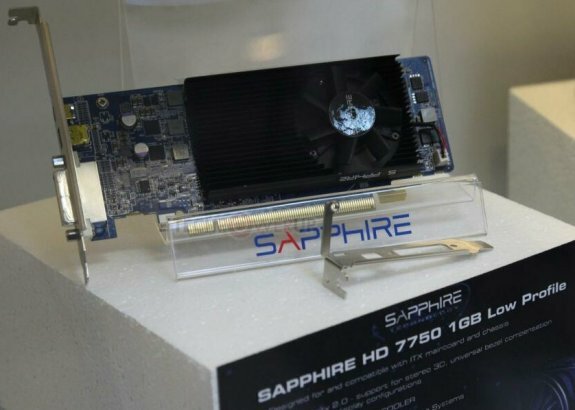 TPU reports Sapphire has a single-slot, low-profile Radeon HD 7750 graphics card on display at Computex. The card has the same clockspeeds as the reference card (800MHz core, 1GB GDDR5 clocked at 4500MHz) and features dual-link DVI, mini-DisplayPort and mini-HDMI outputs. The package will include adapters to convert the outputs to standard-size, as well as a low-profile bracket. The design is a beneficiary of 28 nm "Cape Verde" silicon, which is found to have good-enough temperatures on its reference-design board. The card is ideal for mini-ITX systems. It relies entirely on the PCI-Express slot for power, and uses a 2+1+1 phase VRM, which utilizes high-grade driver-MOSFETs on its GPU phases.